Last weekend, Eric and I drove up to his hometown to spend some time with his family. It was a fun weekend packed with activity, and - as the case usually is - it went by too quickly. Saturday began with a sprinkle but turned into a terrificly lovely day, so we decided to take the opportunity to enjoy the outdoors. We drove a half hour over to the Eau Claire Dells, a place I'd never been, but where Eric had frequented while living nearby. We went hiking, hopped in the river and marveled at the gigantic rocks carved by glaciers millions of years ago. You guys, dells are cool. These dells were formed thousands of years ago, and today we're left with a natural water park of sorts... not the waterparks found in those "other" Dells (wherein the actual dells are no longer the main attraction), but a place filled with waterfalls, little pools of wading water and plenty of areas to climb, jump from and explore. And when I say "jump from" I mean rocky cliffs that tower above a deep pool of river water. 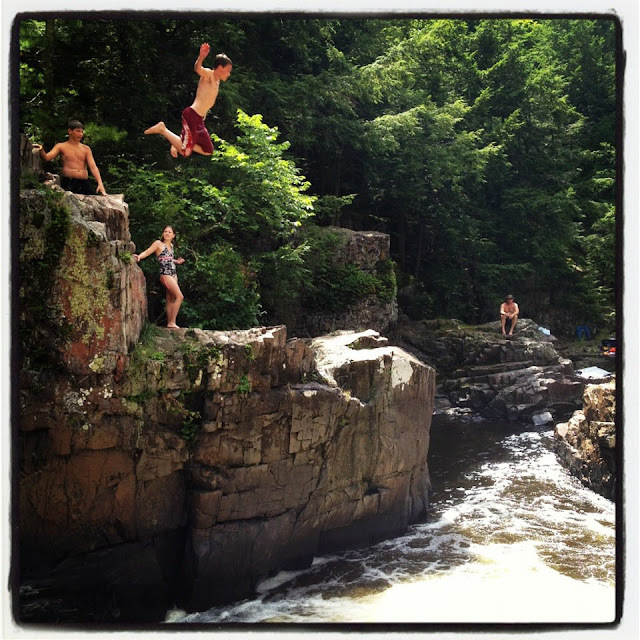 Eric had never jumped from the bluffs at the Eau Claire Dells in all his visits there growing up. Warned of the cliff-jumping dangers, he was always too nervous to take the plunge from roughly 30 feet up. On Saturday, he crossed that jump off his bucket list. Eric, his two younger brothers and I sat on the rocks at the dells for a while, watching some pretty gutsy kids climb, jump, swim and climb again off that cliff, toying with the idea of doing so ourselves. I took the reins, saying I would definitely like to jump, and that it wouldn't seem so scary once we were in the air. After watching these youngsters continue to jump without hesitation, we knew we wouldn't be able to live with ourselves if we chickened out. I didn't get a photo of any of us jumping, but all four of us climbed the bluffs and, one by one, jumped into the white water below. While we only got one chance (shortly after our jumps, the park ranger came over and warned about too many people being around for jumping), so we were all limited to jumping from the area where the girl is standing, above. But seriously, how badass is that kid jumping from the top? The Eau Claire Dells were a lot of fun. The hiking was enjoyable and the swimming in the little dells pools was a good time, too (although there was a lot of strategic navigation around incredibly slippery rocks), but that jump from the bluff was a blast. For me, it was just a jump from high into some water, but Eric couldn't stop talking about how excited he was to cross that jump off his list.... after all, if you were a kid at the dells and were warned of the bluffs with this sign, wouldn't you be a little freaked out to jump, too?